As we shall see in this video, there are two basic ways of forming a sheet of paper, namely, pouring the pulp onto a screen, or dipping the screen into the pulp. Either way, the pulp coalesces into a mat of cellulose and a sheet of paper is formed, seemingly a magical event. Within these two methods of sheet formation, there are many variations, of which we are presenting thirty. All the papermakers shown here represent unbroken traditions of papermaking, many going back in time dozens of centuries, a few even to the origins of papermaking in China over 2,000 years ago. 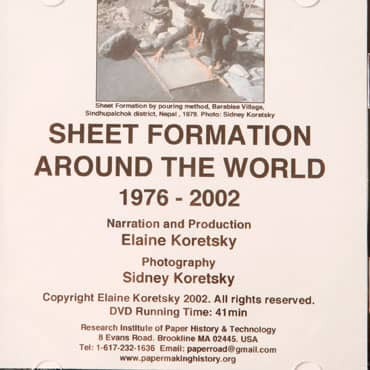 The scenes of sheet formation in this film were selected from tremendous quantities of movie and video footage, the result of 38 field expeditions by Elaine and Sidney Koretsky, spanning more than a quarter of a century, in 43 countries. Sheet formation is observed in China, Taiwan, Japan, Korea, Thailand, Burma, Sikkim, India, Vietnam, England, and Czechoslovakia. The background music identifies the countries and regions shown in the film. Running time: 41 minutes. 1976-2002.